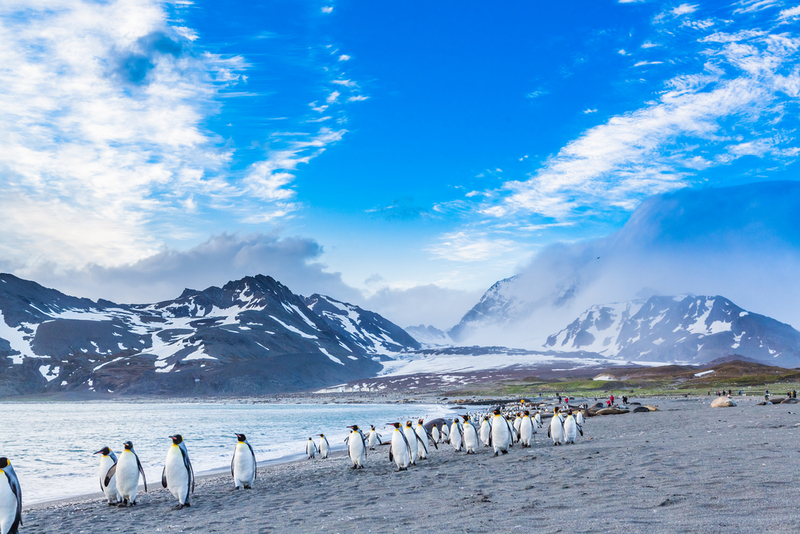 South Georgia and the Sandwich Islands may not be a travel destination you think of often, but it is a place of snow capped peaks and toddling penguins that will captivate you with its rugged beauty and test the limits of your adventure. It sits 800 miles southeast of the Falkland Islands, and more than half of the main island is covered in permanent ice. 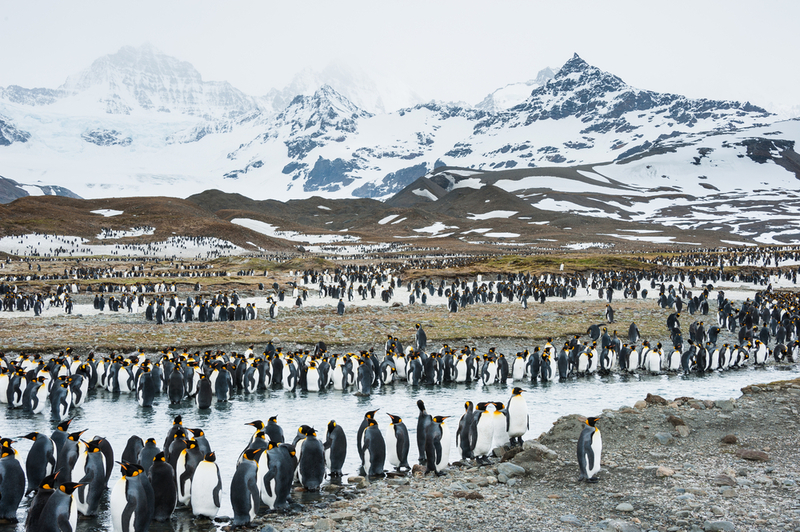 Thousands of King Penguins march for cover of the oncoming katabatic winds. Photo credit: Shutterstock. This environment is the perfect place for a variety of wildlife including seals and a variety of seabirds. It is a cold, windswept land that has captivated explorers since it was first sighted in 1675 and where the explorer Ernest Shackleton was laid to rest. The Islands are an eerily peaceful land with bouts of treacherous weather and unforgiving terrain. It is like a siren song that calls to the adventurous of heart and those that dare to conquer new horizons. It’s a must stop destination on any tour of the Antarctic region, truly the highlight of the voyage! Entering Stromness Harbor in South Georgia. Photo credit: Shutterstock. February 28, 2016: After almost 3 days on a very calm Drake Passage we finally arrived at South Georgia Island very early this morning. With no permanent residents and only about 7,000 visitors per year, it’s truly a rare opportunity that we’ve been presented with for the next few days. The weather is so volatile and unpredictable here that it can be sunny and clear one minute and 15 minutes later 200mph gale force winds with absolutely no warning. Because of this, actual shore landings are far and few between. We have been told that if we make 50% of our planned outings, it will be considered a lucky and successful venture. Today, we lucked out with amazing clear skies and small swells allowing us to complete 3 outings, starting with a 5:30am Zodiac tour, then a 9am landing and another 3pm landing. There is no rest for the weary here! It’s position in the southern sea makes South Georgia Island a veritable mecca of wildlife; home to the largest Antarctic Fur Seal population (about 80% of the world’s population lives here), Macaroni penguins, the beloved King Penguins and so many species of birds and albatross that we must completely block all light emissions from our ship to avoid bird strikes at night. Today I saw so many fur seal pups swimming in a cove that they looked like salmon spawning, stood amongst an unbelievable 300,000 King Penguins (as far as the eye could see for miles), witnessed 3 ton male elephant seals battling for their slice of beach just feet away and was chased by countless baby fur seal pups that were so adorable I almost wanted to let them catch me. Today is truly best described in video – but these pics will have to do for now. The abandoned Whaling station. Photo credit: Shutterstock. Claimed by Great Britain in 1775, South Georgia attracted many with its abundant wildlife such as the fur and elephant seals. The sealing industry took off on the Islands and crews flocked to South Georgia looking to cash in on the abundance of these animals until the nineteenth century when the fur seal population was virtually depleted. From there, a new industry was sought after and a whaling station was built as the first permanent habitation in Grytviken. Men came to the whaling stations and lived in the harsh conditions of the unpredictable Islands hunting whales in the dark waters of the Atlantic. 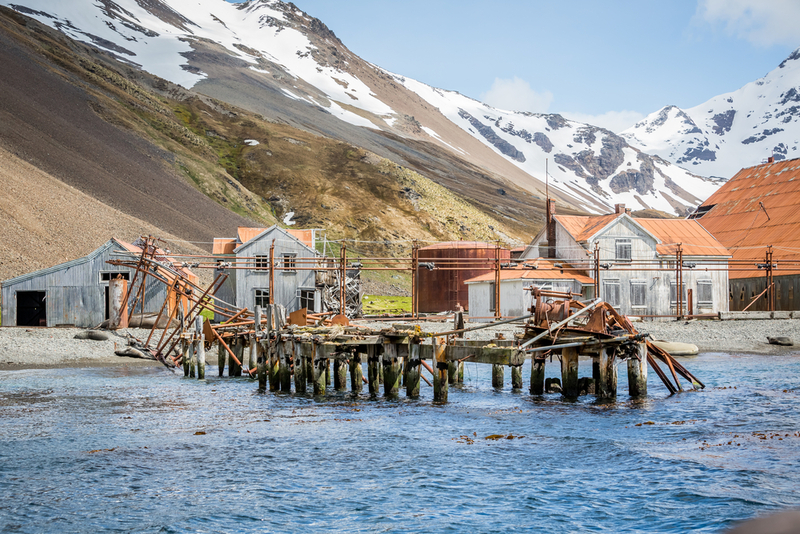 The whaling stations existed until 1965 when they were abandoned and fell into disrepair. February 29, 2016: The scenery around Grytviken is exceptionally beautiful with glaciers and snow capped peaks as a backdrop to this once bustling whaling station. Founded by Norwegian whaler CA Larsen in 1904, its a sad fact that South Georgia is famous for whales, yet they are now a rare sight. Whales were very easily caught, especially after the advent of the explosive harpoon (as seen on the wreckage in one of my photos). A total of 175,250 whales had been processed through the whaling stations of South Georgia prior to their ultimate closure in 1965 (caused only by the depleted stocks). Prior to whaling, Captain Cook reported home with his discovery of South Georgia that “sea-bears” (fur seals) were numerous and so a rush of sealers arrived starting in 1786 to slaughter them. Many more followed, especially from the US and England. By 1825, an estimated 1.2 Million pelts had been taken and the fur seal was nearly extinct on South Georgia. Once again, sealing eventually came to a halt because there simply weren’t any to be found. 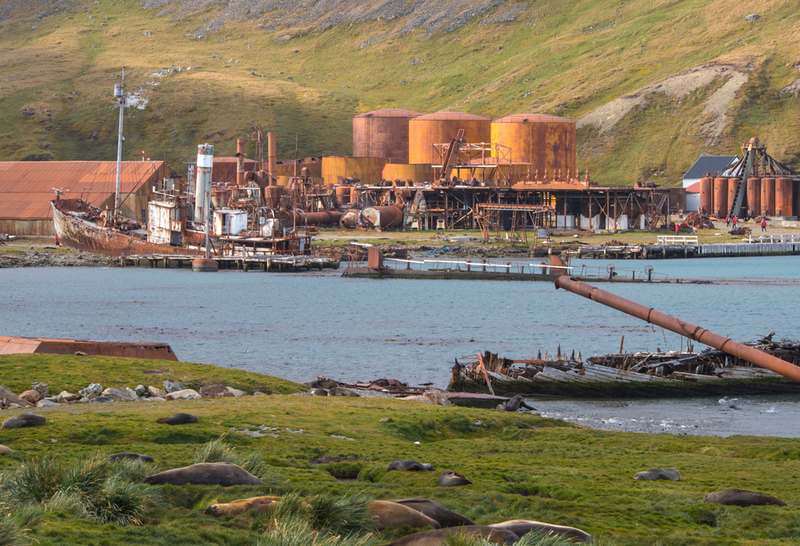 Visiting the rusting remnants of Grytviken today makes my heart happy as the fur and elephant seals have clearly taken over the cove and have made a full comeback in numbers. One of the main attractions for many visitors are the graves of Sr Ernest Shackleton and Frank Wild, who are buried in the station’s cemetery alongside those of the whalers who died on the island. As mentioned in my travel journal entry, South Georgia is also where explorer Ernest Shackleton arrived in attempt to save his crew after his ship sank on a Trans-Antarctic Expedition. The Endurance had set sail in 1914 in hopes of traveling across the Antarctic, but the ship became stuck in ice and eventually sank. Shackleton and his crew survived for over a year on Elephant Island (which we also had the incredible opportunity to stop and visit!) before a group of men including Shackleton made the dangerous trek to South Georgia in order to save themselves. Stromness Harbor, home of Shackleton’s rescue. Photo credit: Shutterstock. When they arrived on the Islands they had to climb the peaks of King Haakon and Stromness in order to reach a whaling station where he could send help to the rest of his men left on Elephant Island. Today, visitors can follow the same trek Shackleton made as he clung to life desperate to save his crew, all of which survived the heinous experience. Years later, the chilly calm of South Georgia is where Shackleton was buried after passing away on yet another attempted expedition to Antarctica. Penguin Colony on South Georgia. Photo credit: Shutterstock. South Georgia is a place that attracts those with a wild heart, eager to experience the many animals that habitat the Islands and the snowy mountains looming in the distance. Millions of fur seals arrive on the shores to breed each summer, and six species of penguins live on the Islands with millions happily waddling along the terrain. There are also millions of seabirds that visit the island including the albatross, a bird often viewed as a good omen to the nautical world. Scientists and British Antarctic Survey still have stations on South Georgia conducting research on one of the most mysterious continents in the world. South Georgia has a long history and incredible beauty that attracts travelers far and wide. It isn’t for the faint of heart but a destination to test your courage and love of the unknown. Isn’t that what life is about? To constantly travel outside of our comfort zones to grow and learn about ourselves in ways we never expected? South Georgia will open your eyes and your heart to a world where only mother nature rules supreme. With the greatest concentration of wildlife on the planet, a captivating history and ruggedly beautiful terrain, the sub-Antarctic island of South Georgia is one of the jewels in the Southern Ocean’s crown. 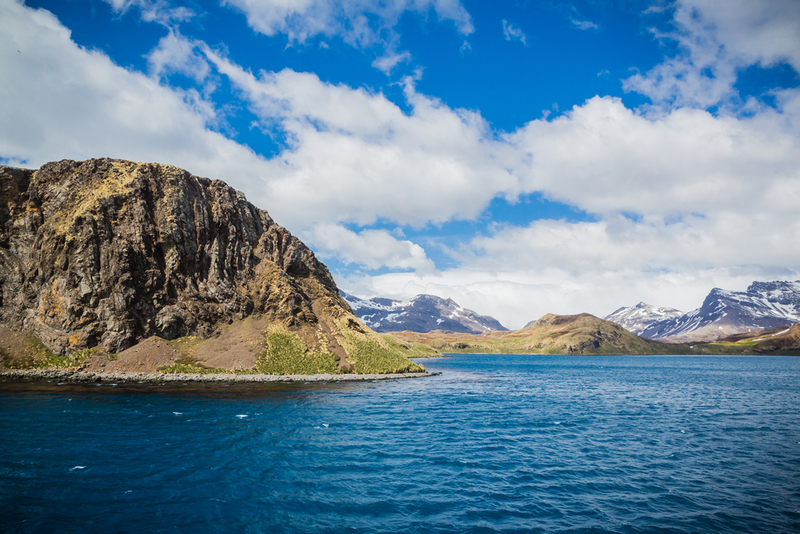 Why not discover it on an Antarctica Cruise with Chimu Adventures? Click here for more information about Chimu.